Staff was was friendly and helpful but I had a sense that that fact that we spoke Spanish was a factor in how accommodating they were. I love that the front door stayed locked and there was always staff to let me in and out. The bar staff was super nice and always attentive. The location was remarkable and the air conditioning was super cold and easy to use. I loved that I had a balcony that looked over the busy street. 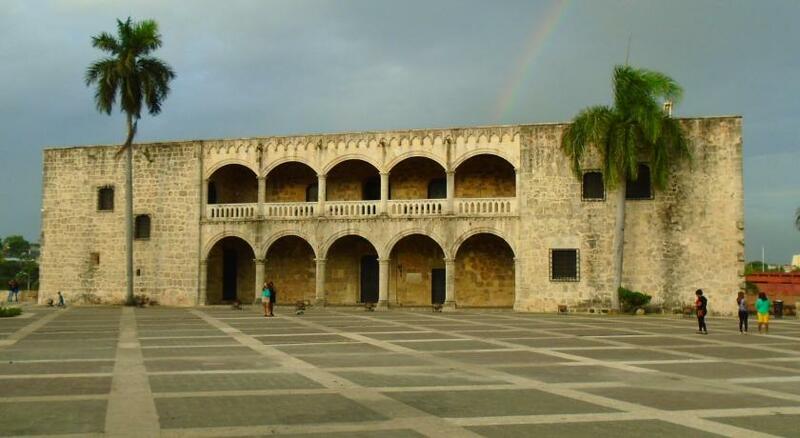 Location is awesome, right in the heart of the Colonial District. Short walk to Columbus' son's old home, which is the start of a historic self-guided walking tour circuit through the old city with plenty of English signs to guide the way. Hotel staff speaks passable English and went out of their way to make sure I was safe. For example, at the end of my stay I called a car on Uber to take me back to the airport (1/4 the price of taking a taxi!). When the car was approx 3 minutes away, I stepped outside to wait on the sidewalk. The very nice lady behind the front desk told me it would be better if I waited inside until the car actually got there. But since the car was so close, I told her I would just stay outside since I was already there. So to make sure I was safe, she waited outside with me until the car came! I left with the impression that they genuinely care for their guests. The property was really close to every single restaurant and attraction in the area. However what really make me give them at perfect rate was the staff. Francisco I really appreciate all the little details and all the help you offer thank you very much. Couldn't ask for a better location. Nice fscilities - not excessive, just right! Nice sitting area on ground floor. The value for the money, the staff, the location to old town which this hotel was almost right in the middle of but yet just a short 3 blocks walk from the Old Town Colonial Center. Rooms were easy to deal with and the hotel price was an exceptional price for the money. Easy Uber ride from the Airport. The Breakfast Buffet was spectacular but took care of the first bite to eat of the day. I loved the staff! Breakfast is great and the view is stunning! 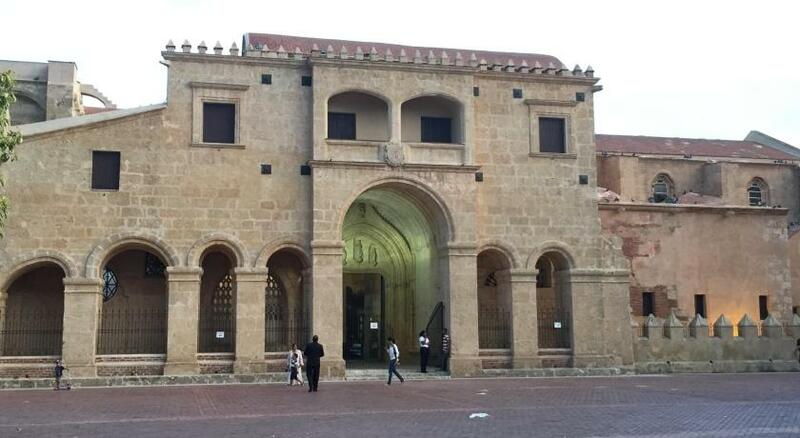 I will definitely stay here next time I visit Santo Domingo! Location and everything is amazing. 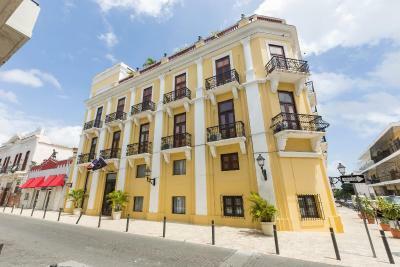 Antiguo Hotel Europa This rating is a reflection of how the property compares to the industry standard when it comes to price, facilities and services available. It's based on a self-evaluation by the property. Use this rating to help choose your stay! 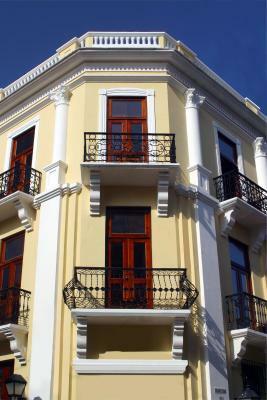 One of our top picks in Santo Domingo.Located in the heart of the first city of America, this hotel offers beautiful architecture and balconies with the characteristic ironwork of the 19th century. It is 30 minutes’ drive from Las Americas International Airport. 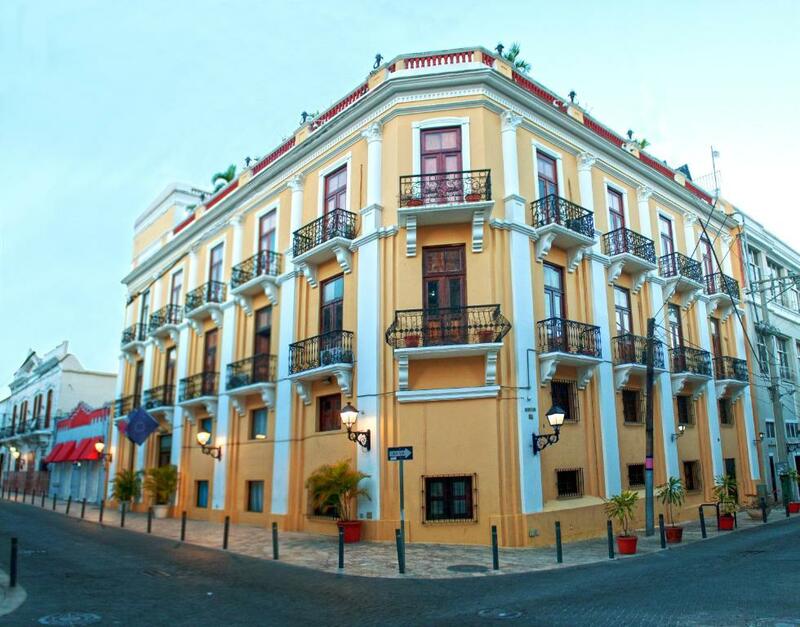 Antiguo Hotel Europa has rooms with free Wi-Fi, cable TV, air conditioning, safety box and complimentary Continental breakfast. The private bathrooms have shower. The Terraza Restaurant offers daily breakfast and features panoramic views of the San Francisco Ruins and spectacular sunsets over the colonial city. The Lobby Bar also has a wide variety of tropical and traditional cocktails. The convention rooms and Internet Center are designed for 8 to 30 person capacity. The hotel has a unique location, a short walk to the monuments and historical sites of the first city of America, just a few minutes from shopping malls. 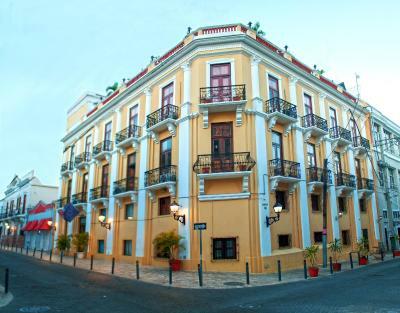 When would you like to stay at Antiguo Hotel Europa? This single room features air conditioning and private entrance. This single room features a balcony, air conditioning and private entrance. This family room features a private entrance, flat-screen TV and air conditioning. This family room has a private entrance and air conditioning. This family room features a private entrance, air conditioning and cable TV. This family room has a flat-screen TV, private entrance and air conditioning. This family room features air conditioning and private entrance. House Rules Antiguo Hotel Europa takes special requests – add in the next step! Antiguo Hotel Europa accepts these cards and reserves the right to temporarily hold an amount prior to arrival. 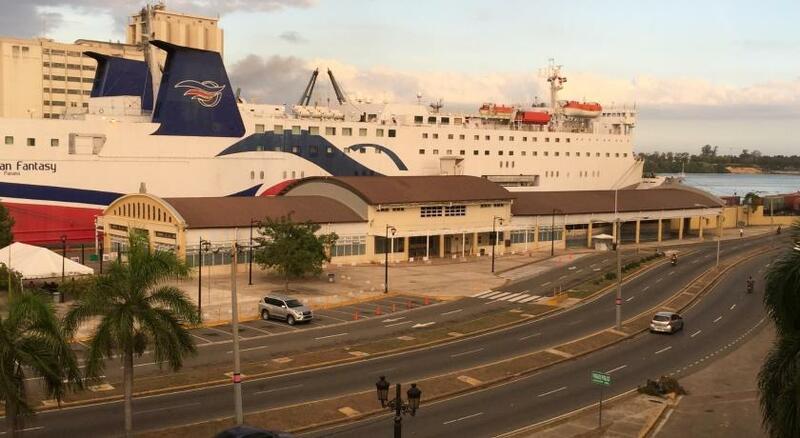 Please inform Antiguo Hotel Europa of your expected arrival time in advance. You can use the Special Requests box when booking, or contact the property directly using the contact details in your confirmation. We did not have a window, but this way it was really quite. Super location right in the colonial centre. Small room. Street noise was generally acceptable except for one evening when there was a free music event. It would have been nice if my room key opened the front door rather than having to knock but I loved how safe it felt knowing only people staying there could get in. Place is extremely loud. It was impossible to get a good night sleep. One morning I called at 5:00 am the front desk to complain about the noise in the lobby that woke up up and I was told by the desk agent on duty : "You must understand that when a group of people talk in an open space that creates echo." In order words: shut up and deal with the noise as if a group of people was more important than me and my friend. Close to all historical sites. Safe to walk. Hallways can be quite noisy, especially late at night if you have neighbors that come home late from a night out on the town. The quality of your stay will ultimately depend on the type of people booked on your floor. Too bad the hotel has no real control over this. Bathroom : awful : no presure to get water, and it was cold ! Pillows were not very comfortable. There was no water pressure and no hot water. Not enough towels but house keeping brought it on request. No windows was not announced before reservation. Free parking was announced but was not available and we had to move our car to the commercial garrage and the reception desk staff told us ithat free parking is not valid for more than 6 months. Nice terrace on the roof. There was no window so the room was pretty dark. The bellman. I really appreciated that he requested a room without the loud buzzing noise from the concierge for us. Cooperative staff, let us check in early.